God forbid, your child becomes separated from you. Would they know how to contact you? Would they remember your phone number? Home or cell? 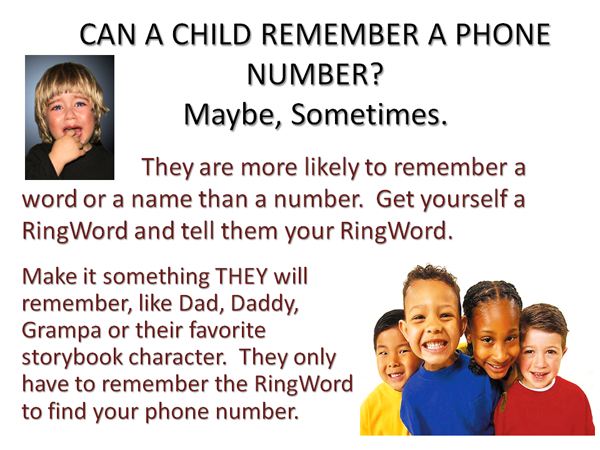 Children may have difficulty remembering numbers or addresses until they are older. How would they contact you? They will no doubt be upset. Will they remember your phone number in a panic state? Why not simply teach them a "word" that they already know, and can always remember, a RingWord. A word anyone with a smartphone can look up immediately and find your contact information. It could be "Big Bird" "Kermit" "MyMom" "TheirName" almost anything they would remember easily. No information about your child is posted, and only the information you want is posted about you. You can encrypt your phone number so bots cannot read it on the page, but anyone who needs to reach you can reach you. It's simple. It's free. It's easy and you'll have peace of mind, until your little one can learn your number. Register. It's not a lot of information to enter and we don't sell it to anyone. Then you have an account to add your word to. Search for the word your child would remember, such as Pooh, Big Bird, Batman, Sponge Bob, their first name. Choose a word they know and could remember even if they are really scared. If it's available add it to your cart, use the coupon code "FIRSTYEARFREE" to get it for free, then it's yours. Please don't enter any information about your child. That's not how it works. You simply tell your child the RingWord. Should they become separated from you, and can't remember their phone or address, they simply tell someone their RingWord is "Sponge Bob" or whatever. That person enters "Sponge Bob" in the search box and all your contact information appears. Phone Number Phone with password "RingWord"